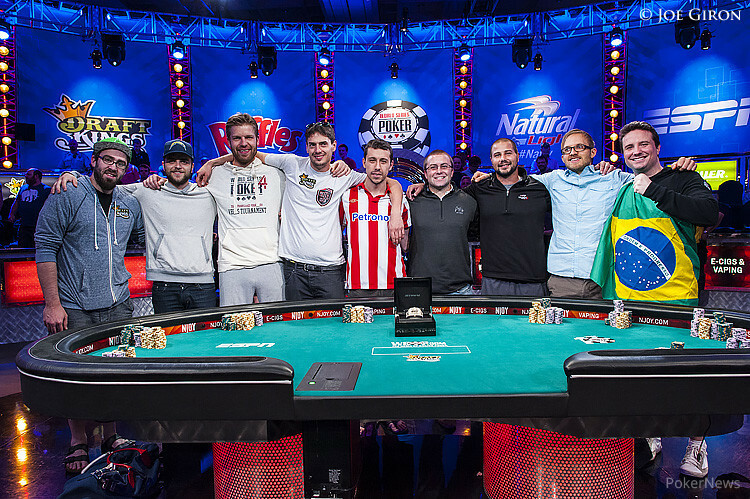 After eight long days of poker in the Rio All-Suite Hotel & Casino, the 2014 World Series of Poker Main Event established its official final table of nine. Leading this year’s November Nine is Jorryt van Hoof, the second Dutch player to ever reach the final table of the Main Event. Van Hoof bagged 38,375,000 chips thanks to two key knockouts in Level 33 — one of the players he eliminated was his fellow countryman, Oscar Kemps. Prior to the 2014 Main Event, van Hoof only had $358,580 in career live tournament earnings. Now he is guaranteed $730,725 and the favorite to capture the $10 million first-place prize. Joining van Hoof at the final table will be Mark Newhouse, who has now made a return trip to the biggest final table in poker. Newhouse finished ninth in the 2013 Main Event for $733,224 after entering the final table last in chips, but this year he is in among the leaders with 26,000,000. The American is the first player to reach back-to-back Main Event final tables since “Action” Dan Harrington finished third and fourth respectively in the 2003 and 2004 Main Events. In order to earn more money than Harrington did in those two years, Newhouse will have to finish in sixth place or higher. Rounding out the 2014 November Nine are Felix Stephensen, Martin Jacobson, Dan Sindelar, William Pappaconstantinou, Bruno Politano, Andoni Larrabe, and William Tonking. 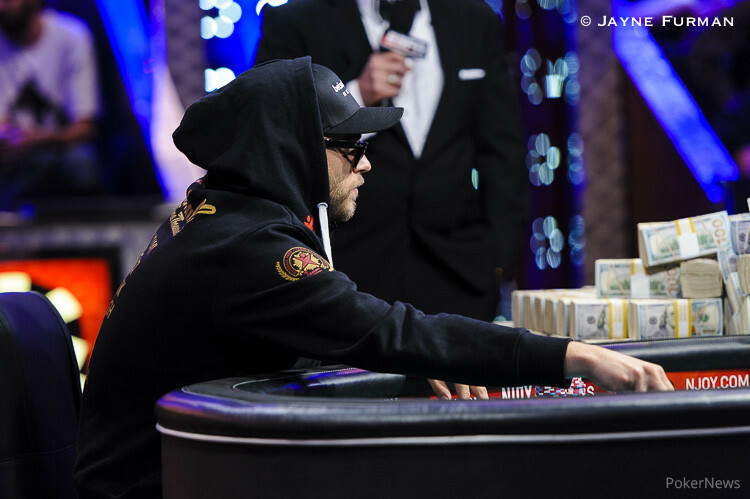 Day 7 of the 2014 WSOP Main Event began with 27 players, and Sean Dempsey was the first player to exit when Newhouse made a flush on the river against him. Brian Roberts (26th), Bryan Devonshire (25th), Kyle Keranen (24th), Yorane Kerignard (23rd), Iaron Lightbourne (22nd), and Leif Force (21st) followed him to the rail. Lightbourne was in great shape to double up with pocket queens aqainst Dan Sindelar’s ace-queen, but Sindelar flopped an ace and the Brit couldn’t find a one-outer or running straight cards. The next player to exit was Dan Smith, who called a four-bet shove from van Hoof in Level 31, creating an 80-big blind pot. The two were flipping, Smith with ace-king of spades and van Hoof with pocket fours, and the wired pair held as the board produced but one paint card — the . Online legend Scott “urnotindanger2” Palmer exited in 19th place, running pocket deuces into pocket aces, and he was followed out the door by Scott Mahin (18th), Andrey Zaichenko (17th), Eddy Sabat (16th), and Thomas Sarra Jr. (15th). Sarra Jr. tried to get tricky, calling a raise from Newhouse then four-betting over a three-bet from Stephensen. The Norwegian moved all in, and Sarra Jr. called of his remaining 30 big blinds with king-queen. Stephensen had him dominated with ace-king of spades, and Sarra Jr.’s Main Event dreams were dashed by the turn. The eliminations of Kemps (14th), Craig McCorkell (13th), Christopher Greaves (12th), and Maximilian Senft (11th) brought us to an unofficial final table of 10. 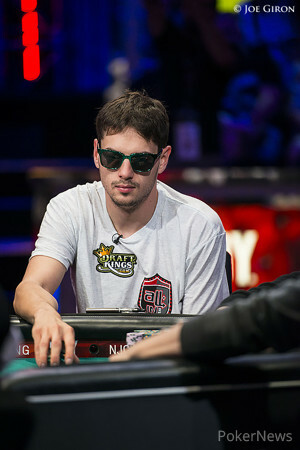 On the sixth hand at the unofficial final table, Tonking flopped the nuts against Jacobson, who had the nut flush draw. Jacobson failed to find a club on the turn or the river, and Tonking successfully doubled through. Eleven hands later, Larrabe was all in and at risk with pocket aces against the ace-king of Velador. There was a king in the window of the flop, but once again the best hand held up. Velador suddenly found himself on the short stack, and moved all in on Hand #24 over a raise from Politano and a call from Newhouse. The action folded back to Newhouse, who tank-called with pocket fives, and he had Velador's pocket fours dominated. Velador failed to improve his hand, and when the final card was dealt the Amazon Room exploded into a chorus of songs and chants, The Brazilian contingent even fired off confetti cannons, spraying green and yellow bits of paper throughout the stands. On behalf of PokerNews and the WSOP, we would like to thank everyone for following along all summer long. Bracelets were won, history was made, and now we are just four months away from crowning yet another Main Event champion — a champion that will win $10,000,000. For now, this is our final good night from Las Vegas for the summer, but we'll see you right back here in early November for the conclusion of the 2014 World Series of Poker Main Event!